The Bad Kitty Bakery: Eat Right with Rosemary Carrots! Recipe Included! Eat Right with Rosemary Carrots! Recipe Included! In the spirit of eating lighter, I have been eating more fruits and vegetables now than I have in years. It is a lot easier to eat right when you are consuming a pound or more of veggies a day and at least a pound of fruit. Some of you are thinking that does not sound like a lot, and some of you are wondering how I find room to eat anything else. Some veggies I love eating raw and just as they are. One of my favorites is cucumber slices. Those are just epic. Cauliflower that is raw but dipped in my miso Dijon dressing makes my toes curl. Other veggies are a little better cooked. I like roasted cauliflower (have you noticed I love cauliflower?) I also love making large pots of all veggie soup. Those are great when I need something late at night that is warm, comforting, and low in calories. 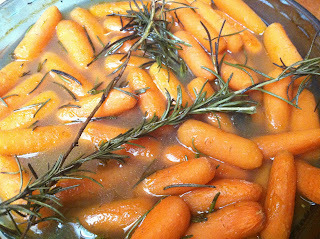 Another quick and easy favorite of mine is rosemary carrots. This takes just 20 minutes to bake, and it is easy to throw in the oven when you are making other tasty foods. Best of all, this lets me use some of the metric ton of rosemary that is in my yard. I got a cute baby rosemary plant for our wedding, planted it, and now it is a monster!! I love it because it means these carrots are always easy to make. When you need a nice side dish, or want to eat the whole thing like popcorn while you are watching a movie on Netflicks, this is a great option!! Combine all ingredients and roast at 425 degrees for 20 minutes. P.S You can use other herbs that you really like, too! These would be great with thyme, oregano, or you name it! Have fun! Black Bean Veggie Soup with Recipe and Gossip!